The Darwin Selection comprises Darwin's two most famous works, 'On the Origin of Species' and 'The Voyage of the Beagle'; revolutionary research and a fine travel writing in combination: the account of Darwin's 1831-36 travels across the globe on the H.M.S. Beagle is vivid, entertaining and witty. Evolutionist and passionate Darwin-proponent Dawkins reads carefully considered extracts in an accessible and endlessly fascinating presentation of the text. 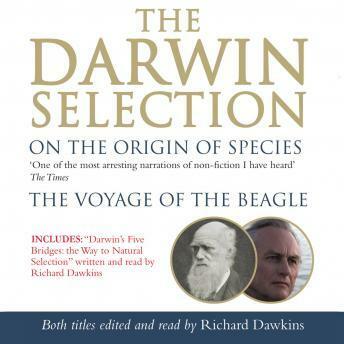 Includes bonus material "Darwin's Five Bridges: the Way to Natural Selection"Â, written and read by Professor Richard Dawkins.